Our friends Paul and Lynda were over for dinner when we served our version of Rouladen. They just loved the meal and asked if Harry and I could do a cooking lesson so they could learn how to make this traditional dish. We were more than happy to share a very old family recipe with them. The best part was they came over to cook and we all got to sit down to a lovely meal together. 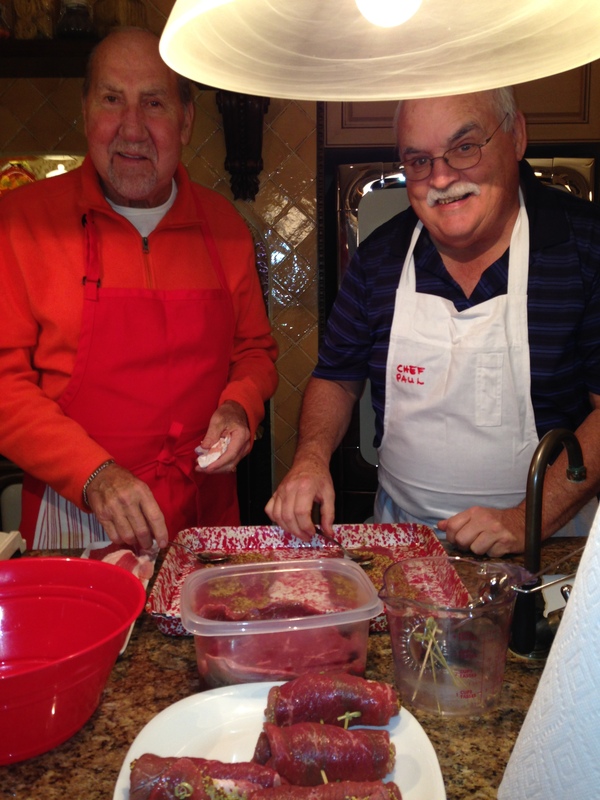 There’s nothing like cooking with friends and family! Harry and Paul did the meat prep. Guys love that sort of thing. This is how the Beef looks before you season it with the Mustard, Bacon and Pickle. 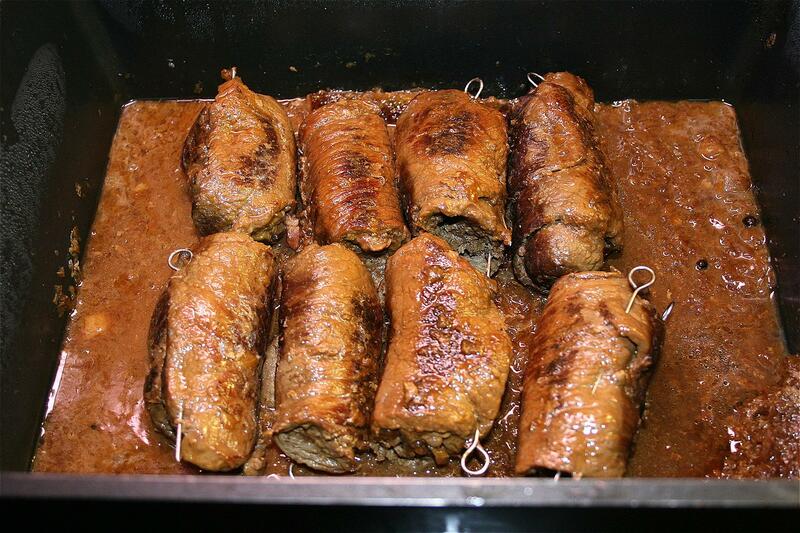 Each Rouladen is one serving. We like to make them 8 at a time and freeze the leftovers for a fast week night supper. 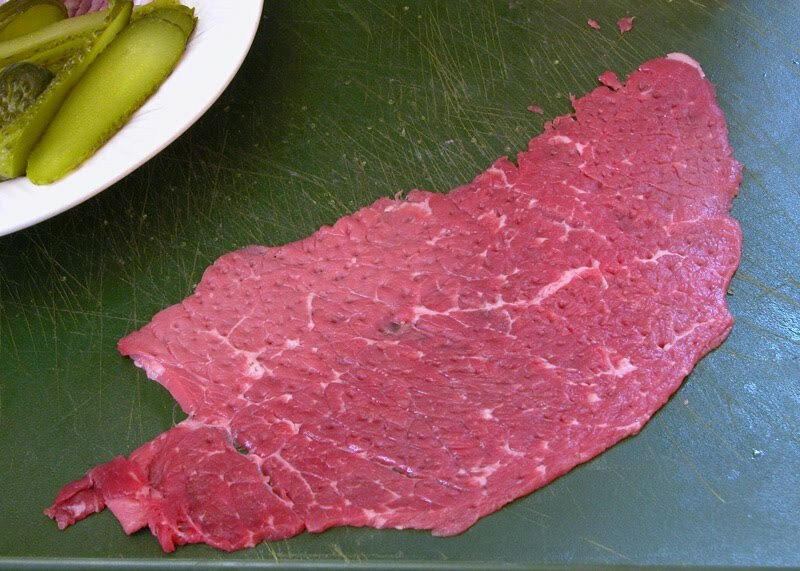 Lay the beef slices on a plastic cutting board, spread with a tablespoon of mustard. Lay on a slice of bacon. Place a small dill pickle at one end of the meat and roll up. Secure with a skewer. Brown the rolls in a heavy skillet on the stove top. They should be browned all around. Once the Rouladen are browned, combine the gravy mix and water. Pour it over the meat. Cook it on the stove top until the gravy thickens slightly. Now place the pan in the oven at 350F till tender. This should take from 1-1 1/2 hours. The gravy mix is not traditional but it gives an excellent result without fuss. It’s Ok to add an ingredient that is ready-made provided its good quality. 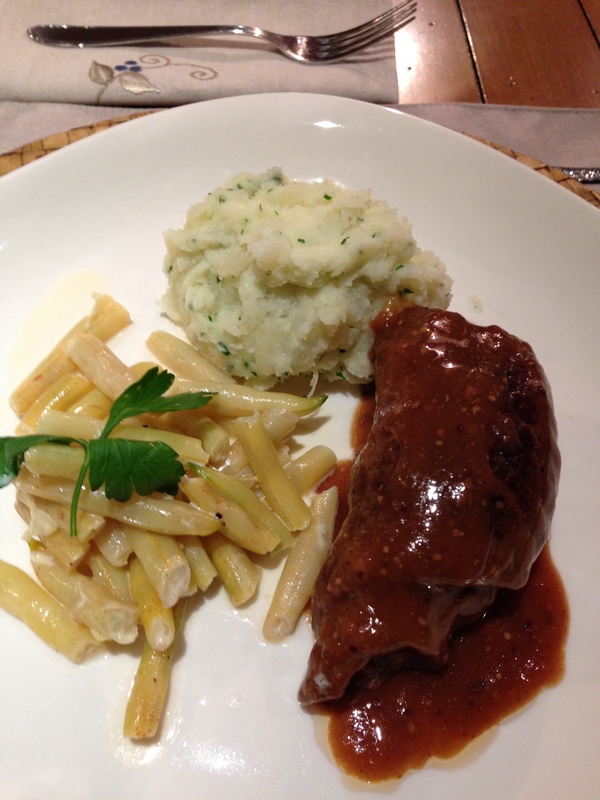 We served the Rouladen with Mashed Potatoes and Aunt Iona’s Wax Beans with cream. Spatzle or Potato Gnocchi pair equally with this rich meat dish.